As of today we are less than ONE YEAR AWAY from Star Wars: The Force Awakens! Oh and less than one week away from Christmas too. If you still haven’t purchased the perfect gift for the special Star Wars fan in your life (my mailbox has remained strangely empty), it’s not too late! On Amazon, you have until TODAY via regular shipping, and Monday via 2-day shipping, to order and receive orders by Christmas. ThinkGeek gives you 2 more days from today. See? Plenty of time! Below are a few suggestions to help make sure you have a Force-filled Holiday Season! Ahsoka Tano’s Ashley Eckstein’s Her Universe has an impressive (most impressive) collection of Star Wars jewelry for the fan girl in your life. I thought the R2-D2 Pearl Cuff Bracelet was a particularly classy way to let her geek flag fly. If jewelry isn’t her thing, the Rebels Skirt is pretty great. Finally, these Bowling Bag Style Purses from Think Geek are amazing. That R2 design makes me want to carry a purse. Wait…did I type that out loud? I’m no Andrew, so I can’t really speak to sound quality, but I’ve long admired this super cool looking Death Star Bluetooth Speaker. Tell me that wouldn’t look impressive on your office or home desk. Now if only I could get little X-wings and TIE Fighters flying around it. Although I’m a huge Star Wars fan, sometimes I want accessories that are more subtle. That’s why I like these watches/chronometers from Think Geek. There’s an even more subtle Stormtrooper version in white. But the red here lets the dark side out a bit more. I love these Rebel and Imperial wallets. A while back I was at the market and the cashier saw my Star Wars iPhone case. 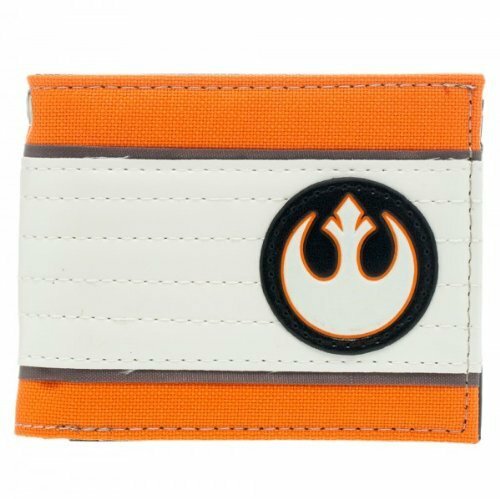 He got all excited and pulled out one of these Rebel wallets. We then became best friends. Just kidding. These are fairly affordable and look great. I just wish the Imperial was black with red trim. Playskool recently released this Amazon exclusive Jedi Force Imperial Forces Pack. It features one of almost every trooper, including yet another toy appearance of the mysterious Shadow Trooper. (Just to clarify, this clearly isn’t JUST for younglings…I want one myself pretty badly). James Hance is a great artist who does some really fun and sweet mashups. He has some fantastic prints for your youngling’s room. For something a little more high end, I love this line of “Destiny” prints by Nick Scurfield. He has prints featuring Luke, Han, Chewie, Anakin and even Ventress! My personal favorite is this Leia because I feel like I can totally see a young Leia acting like this. 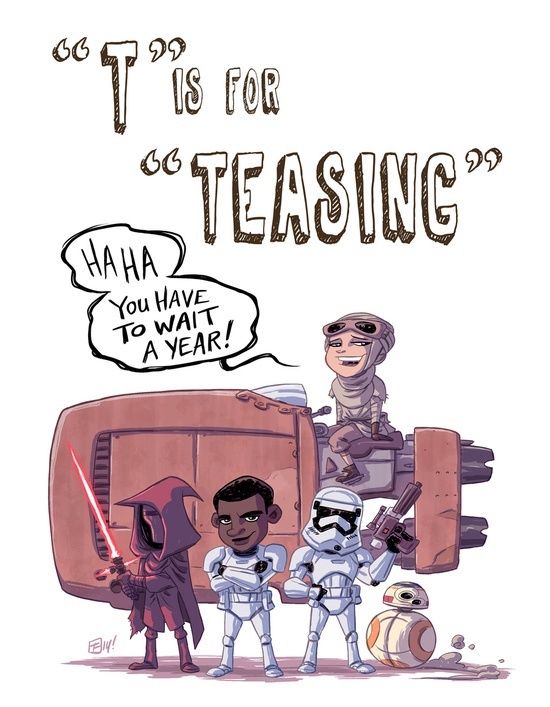 Also, one of my favorite artists, Otis Frampton, did a super cool print in honor of the TFA teaser. You can pick one up for just $15. And if you REALLY want something unique related to TFA, keep reading. I’ve mentioned this before as being one of the coolest collectibles I’ve seen in a while, but the “Space Keys” lightsaber keys are great affordable gifts. Now available in purple and green! You can get a pair for just $9.95 or all 4 for under $20. Of course, Star Wars Lego are always a good way to go, and Lego seems to have made a conscious effort to release more budget friendly sets recently. The Microfighter and Battle Pack lines are cool and reasonably priced. They look great on an office desk too! It’s winter, it’s cold…need this Lightsaber Umbrella you do! I saw someone carrying this outside my office window the other day and I was green with envy. If I didn’t have an awful habit of losing umbrellas I would definitely get 1…or 2…or 3. In preparation for Celebration, every fan can use a portable charger. This new line of “power tubes” from Mimoco is perfect for the SW fan. That and I’m just a sucker for anything that looks like a lightsaber. They also feature designs with C-3Po, Vader and a Stormtrooper looking like they’re squished into a tube. Hot Toys seems to be the company really killing it with their high-end collectible releases. The recently announced Quarter Scale Boba Fett made jaws drop. Of course it won’t be available until the end of next year, but which collector won’t gladly wait for this incredible item? It features incredible detail, multiple weapons, interchangeable hands, a variety of accessories and a cool Jabba’s Sail Barge stand.